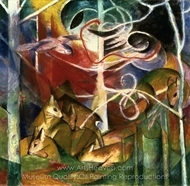 Franz Marc was one of the principal painters of the German expressionist movement. 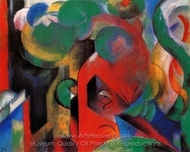 Marc was born in Munich and studied at the Academy of Fine Arts, Munich starting in 1900. In 1903 and 1907 he spent time in Paris and discovered a strong affinity for the work of Vincent van Gogh. 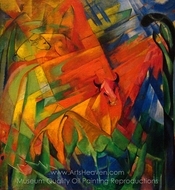 Marc developed an important friendship with the artist August Macke in 1910. 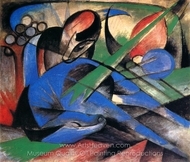 In 1911 he formed the Der Blaue Reiter artist circle with Macke, Wassily Kandinsky, and other artists who decided to split off from the Neue K�nstlervereinigung movement. 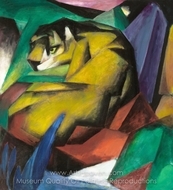 He showed several of his works in the first Der Blaue Reiter exhibition at the Thannhauser Gallery in Munich between December 1911 and January 1912. 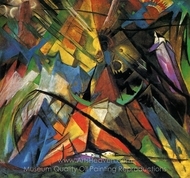 The exhibition was the apex of the German expressionist movement and also showed in Berlin, K�ln, Hagen, and Frankfurt. 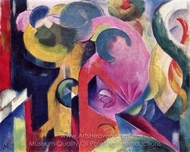 In 1912, Marc also met Robert Delaunay, whose use of color and futurism was the next major influence on Marc's work. Marc began becoming increasingly influenced by futurism and cubism, and his art became increasingly stark and abstract in nature. 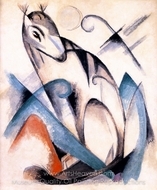 Most of Marc's mature work portrays animals, usually in natural settings. 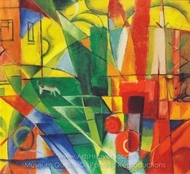 His work is characterized by bright primary color, an almost cubist portrayal of the animals, stark simplicity and a profound sense of emotion, which garnered notice in influential circles even in his own time. 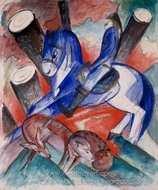 In October 1998, several of Marc's paintings garnered record prices at Christie's art auction house in London, including Rote Rehe I (Red Deer I), which sold for �3.30m. However this record was exceeded in October 1999, when Der Wasserfall (The Waterfall) was sold by Sotheby's in London, to a private collector, for �5.06m. 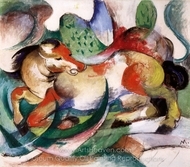 This price set a record for both Franz Marc's work, and 20th century German painting.